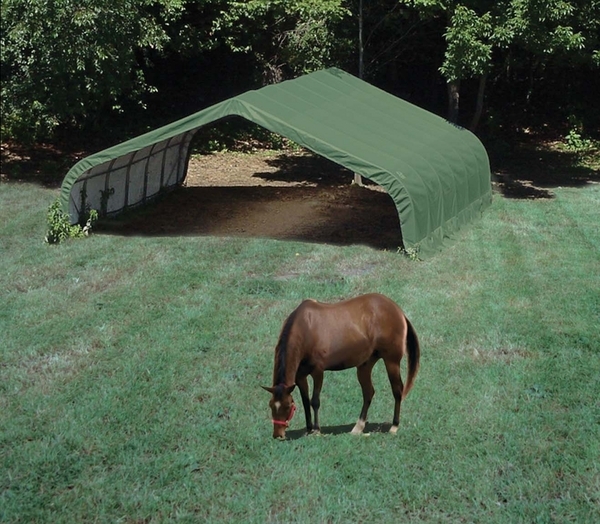 This Storage Shelter by measures 22 x 24 x 12 and is the fastest and easiest way to provide instant shade and protection from the elements for your livestock, and also provides a dry, protected area to store hay or feed. The high grade steel is designed to withstand the most rigorous test of weather and durability and this Run-In instant shelter assembles quickly and easily. The white interior lining enhances the illumination, is also tear resistant, and features fabric corner boots to protect your livestock from ratchets and tie-downs. The heat-bonded, triple layer polyethylene cover has enhanced weave to ensure it stays 100 percent waterproof.